The course developed the derivation of the heating and cooling application equations, along with simplifying assumptions. 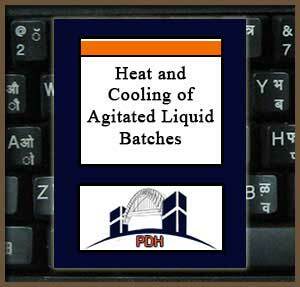 Two examples were given: heating in a jacketed agitated vessel, and cooling with a submerged coil in an agitated tank. The physical property data required for the examples consisted of readily available information: an average batch liquid density, an average batch liquid heat capacity, saturation temperatures of the heating and cooling mediums used. Have an understanding of simplified batch heat transfer relationships within a well mixed tank. Be knowledgeable in the assumptions used to calculate batch heat transfer relationships. Be able to calculate batch heating and cooling requirements with isothermal heating or cooling mediums.